Our Boutique Ivory Round Clothing Racks allow for a combination of merchandising options. The translucent opal, ivory finish looks stunning next to the rest of the rack collection but can be personalized with one of our five complementing rounder toppers, allowing you to create attractive merchandise displays with costumers and countertop mannequins. With a 36" diameter you are able to maximize space with almost any style of hanging product and an array of items to be highlighted on the flat surface of the topper. 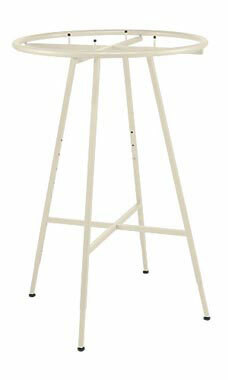 The legs of the round clothing racks extend from 48" to 72" high in 3" increments with simple, adjustable push buttons.